There was a good turnout for the Rookery Waters Saturday Open on the Magpie Pool. Top rod from peg 35 was Tony Watling, who caught 51lb 14oz on the long pole with sweetcorn. A close second with 51lb 4oz from peg two was Wayne Shepherd and Tony McGregor came third with 46lb 12oz. Anglers fishing the last March DAA Open of the season saw the Old Nene in good form. Martin Roper topped the field with a level 35lb of tench and bream from the end peg on the March Bypass section. Second with a net of rudd from the Wigston Bridge section was Rob Hubbard with 17lb 9oz, followed by Rob Wright with 14lb 6oz. Raveley Drain was in a dour mood for last week’s Tuesday Club match. Topping the field with a modest 3lb 2oz of small fish was Nigel Briggs, who caught on the pole and waggler. Alan Jopling came second on 1lb 15oz, followed by Mike Mohan with 1lb 12oz. Once again the Twenty Foot Drain at Whittlesey produced some good weights. Mike Mohan finished out in front with 10lb 14oz followed by Mel Saggers (10lb 2oz) and Dave White (10lb). 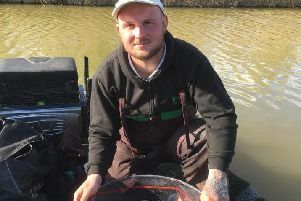 Webb’s AC split their match at Float Fish Farm Fishery over the Horseshoe and Wagtail pools. Leading the way from peg 22 on Horseshoe was Mick Wright with 46lb 7oz followed by Martin Delegate (27lb 7oz) and Peter Telzewski (19lb 1oz). Over on Horseshoe, Dave Marzell won with 81lb 15oz of carp caught on a small feeder and pole. Second was Mick Linnell (54lb 4oz) and third Alan Forrest (53lb 13oz).